Nodaiwa, established about 200 years ago, is now run by the fifth generation of its owners. The flagship restaurant is in a transplanted timber farmhouse in the Higashi-Azabu area of Tokyo. It has a Michelin star. But we went to the branch in the Ginza, where we could easily get a reservation and walk from our hotel. The cuisine is supposed to be the same, even if the traditional ambience is not. The Ginza restaurant, which is accessible from the Ginza subway station, seems to be mostly for business lunches and early dinners. It is next to the highly recommended yakitori restaurant, Birdland, and across the hall from the very famous sushi restaurant, Jiro. There were only a few other diners, but Linda and I were warmly welcomed and seated when we went for dinner on April 8, 2013. 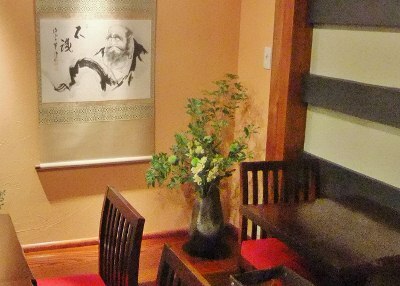 The décor is a modern version of a traditional Japanese restaurant. Fortunately there were Western style tables, which I think is not the case in most of the flagship restaurant. English wasn’t spoken, but there was a menu in English. There are a few menu options. We chose one which would give us several versions of unagi, freshwater eel, which is the specialty of Nodaiwa, the only reason to go there. 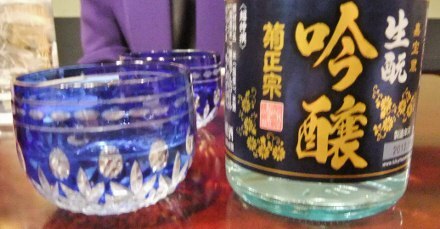 We ordered a bottle of sake. The chopstick holders are eels. Rich braised maguro tuna, greens (they were good, but I don’t remember what they were) and eel in jelly cubes, which were very good. Shirayaki: eel steamed and grilled without sauce. This is a favorite of the purists as it presents the unadorned flavor of the eel. Nodaiwa says that it uses only wild-caught, not farmed, eels. They are kept alive in tanks until needed. 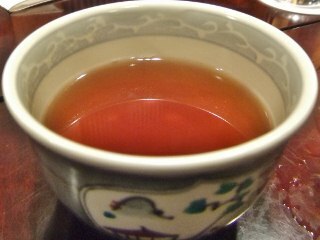 The pure flavor was certainly there for us, but eventually this became a bit dry and boring. 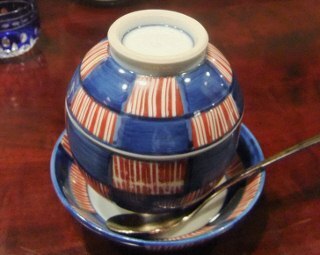 This custard was made with eggs, dashi and eel. 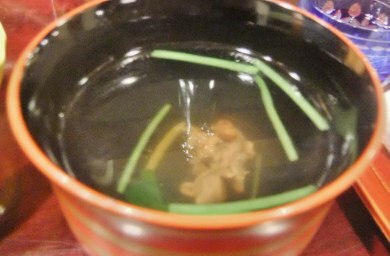 This was also thickened and flavored with sharks fin, which I would not have ordered by itself. The fibers were evident in the custard, which provided a nice break between the two grilled eel dishes. .
Unaju (Spitchcock:) split, sauced and broiled eel. The eels were split lengthwise into thin slices. They were steamed to reduce the fat; basted with kabayaki, a slightly sweet sauce of soy, mirin etc and then grilled over good charcoal. 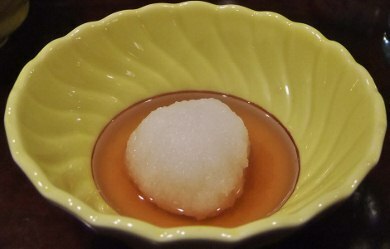 They were presented in a lacquer box over rice. Ponzu sauce with daikon was served, but seemed redundant to me. 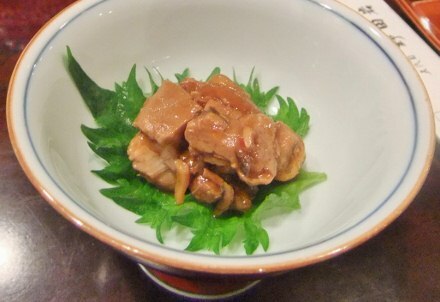 This is a more common way to serve eel than Shirayaki. The freshness and quality of the eel is important. The sauce and charcoal provide subtle differences. The rice softens the richness and absorbs some sauce. We found this to be elegant and good, but the portion was large and it became boring before we were done. 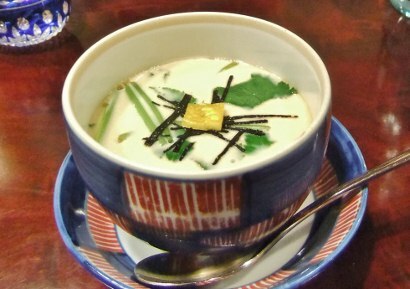 Kimosui: soup with eel liver. This was slightly bitter, (and the pickles a bit sour) which was nice after the sweetness of the unaju. 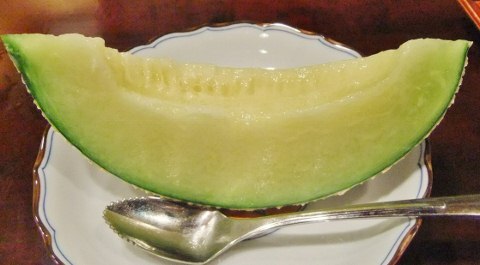 The dessert was melon, returning to sweetness. Tea returned the game to a bit of bitter. I was glad we went as we now have a frame of reference for unagi, which we order a lot in sushi and other Japanese restaurants. We will continue to enjoy it although it will seldom, if ever, have the same fresh elegance and texture as the eel we enjoyed at Nodaiwa. The best way to get there is to go down the stairs in front of The Suit Company to the left of the main entrance of the Tsukamoto Sogyo Building across the Harumi-dori from the Sony Building.